Zebra ZT600 Series replaces Xi Series | MIDCOM Data Technologies, Inc.
Zebra Technologies Inc. has announced that in addition to the launch of the new ZT500 Series, they are also set to release the new ZT600 (including ZT610 and ZT620) as well on July 18, 2017. The ZT600 (including ZT610 and ZT620) will be replacing their long-running Xi Series. The ZT600 (including ZT610 and ZT620), like the Xi is designed for heavy industrial use, but also has consumer features, making it very user-friendly. The ZT600 (including ZT610 and ZT620) comes with large color display screen and an icon-based user interface, as well as a side-loading media and ribbon mechanism, lighted media pathway, color touch points, and a cover open light, allowing for easy accessibility and optics. This printer also offers 600dpi print on labels as small as 3mm, and also features Gigabit Ethernet, Bluetooth 4.0 and Dual USB host ports. Like the Xi, the ZT600 (including ZT610 and ZT620) is a designed for high-volume applications and harsh environments and will provide superior print quality and reliability. 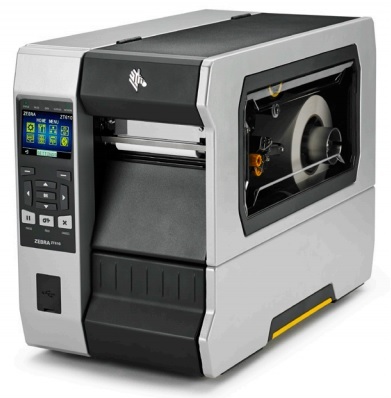 For further information on the ZT600 (including ZT610 and ZT620) and all of Zebra’s product line, as well as additional assistance with your printer and labeling technology needs, call us at (800) 643-2664 and immediately talk to one of our friendly representatives; or chat us up on Facebook, Twitter, Google+ and LinkedIn!